Swamimalai or Thiruveragam , a holy place near Kumbakonam, in Tamilnadu - South India, houses one of the most sacred temples of Lord Muruga and is the fourth Aarupadai Veedu . Saint poet Nakkerar, in his songs in praise of Lord Senthil Andavar, places Palani in the third place amongst the six battle places ( Arupadaiveedu ) that Lord Muruga has fought to win over evil. 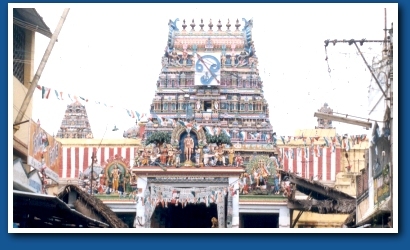 A few Murugan devotees do consider that Marudamalai Murugan temple also deserves to be mentioned as one additional Padai Veedu. The various names of the presiding deity include Skanda, Swaminatha Swamy, Subrahmanya though the most used name is Thagappan Swami as Lord Muruga is seen as one who preached the Omkara Pranava Mantra to his father Lord Shiva.